Bhandari Swiss Cottage is a deluxe and well reputed lounging property among its category resorts in Rishikesh. What makes it unique is that perfect blend of style, simplicity, comfort and dedicated services that has always kept this resort a notch above than all it contemporaries since its inception. The auspicious and ever so blessing holy river Ganga and naturally endowed lush green, peaceful, serene and exotic Northern Region of Himalayas offers a pleasant sight for sore eyes. The resort cater to its guests from its customer oriented package deals that includes romantic honeymoon packages, tour & holiday packages, adventure tours, etc with an aim to leave your heart with a desire to relieve those moments again and again. 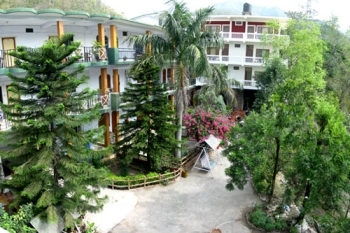 The hotel is located on the Bypass Road at Tapovan, Rishikesh in Uttarakhand. Rishikesh is situated on National Highway 58 which connects Badrinath and is located at a height of about 1360 feet above sea level. The major attractions are Lakshman Jhula, Ram Jhula, Triveni Ghat, etc. Besides being a major tourist attraction itself, there is much more to explore in region surrounding Rishikesh one of such sights is Nilkanth Mahadeo temple (12 km)at a height of about 5000 feet which serves as a mythlogical significance. Rooms are available in four categories that are equipped with unique facilities and services that are entitled with customers requirements and budget. The rooms are classified under A.C. Suite, Double Deluxe Rooms, Semi Deluxe Rooms and Semi Deluxe Rooms. All rooms are furnished to meet the expectations of discerning guest as each room portrays the reflection of the bygone Portuguese era. The traditional décor are conjoined with modern day luxuries to make a perfect blend of luxury and exotica. The multi-cuisine restaurant serves Indian, Continental and Chinese food. The enchanting surroundings, dedicated service staff and mouth watering taste makes up a finger licking dining out experience that is neither boring nor pretentious. The restaurant can cater an informal and relaxed presentation to large or small groups in convivial meal or buffet segments. - Centrally air-conditioned rooms, LCD with satellite transmission, intercom telephony, choice of king and twin bed, rug cloaked floors, study table, etc. - Free Wi/Fi enabled premise, laundry and dry cleaning, doctor on cal, ayurvedic massage and yoga, travels desk, motor bike on hire, restaurant etc. - Rejuvenation Tours that include ayurvedic spa massage facility, yoga and meditation camps, pilgramage tours, etc are regularly organise by the resort. Adventure tours such as rafting with beach camping , trekking, wildlife tours are also organise by the resort that comes with various packages according to the wishes and budgets of the concerned guests. - Children's above ten years will be counted as extra person. - Check-out time 12:00 noon. - Above tariff are subject to change as per the Season. The resort also organise pilgrimage in various packages that includes Chardham Tour, Kunjapuri - Haridwar, Surkanda Devi - Mussoorie, Chandravadni - Devprayag, Rishikesh - Haridwar, Rishikesh - Neelkhant Mahadev. By Air - Nearest airport to reach Rishikesh is at Jolly Grant Airport in Dehradun at a distance of 21 kms. One can take taxis from Jolly Grant Airport to Rishikesh. Daily flights are available from Delhi to Jolly Grant Airport. By Rail - Rishikesh is well connected by railway from major North India railway station. Many trains from Delhi and other major cities are available to reach Rishikesh. By Road - Rishikesh is well connected by motor able roads with major destinations of Uttarakhand and northern states of India. Luxury and normal Buses to Rishikesh are easily available from ISBT Kashmiri Gate(235Km) and Meerut (160Km). Buses and Taxis to Rishikesh are available from major destinations of Uttarakhand like Dehradun (33Km), Haridwar (22Km), Srinagar (110Km), Tehri (75 Km), Uttarkashi (172.3 km), etc.